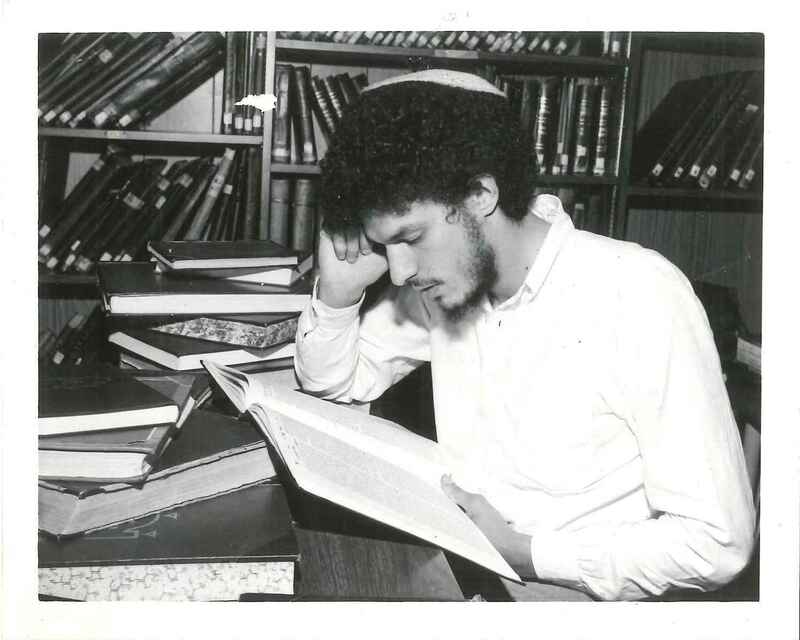 Status: Unidentified – do you recognize this diligently studying Yeshiva student, c. 1985? Photo taken by Jerome Esterson. Welcome to this week’s segment of our 2019 #TravelTuesday series: Traveling with Grace. Today Grace continues her trip through Florida, exploring Palm Beach, St. Petersburg, and Tampa. 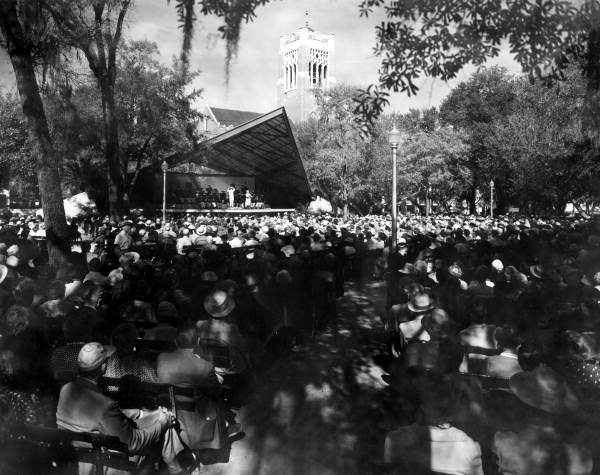 March 17, 1925: We took the bus for Palm Beach at 11 a.m. I was sorry to leave Miami with its gay throngs and pleasant excitement, its bright sunshine and balmy breezes. We arrived at West Palm Beach at 2 P.M. crossed to Palm Beach on the ferry and tool a rolling chair for a 2 hours’ ride along the N. Lake Trail. This was a beautiful ride on a smooth tree shaded path, the breeze blowing softly across Lake Worth on one side with its sumptuous yachts riding at anchor and on the other side magnificent gardens and jungle land. Our place belonging to Mrs. Cragins is called the Garden of Eden and contains hundreds of varieties of tropical plants, including rubber, cabbage rubber, royal poinciana, traveler’s palm which holds water in the stalks, different kinds of [crotons], silk and ribbon palms, to mention only a few that our [puslier?] pointed out to us. 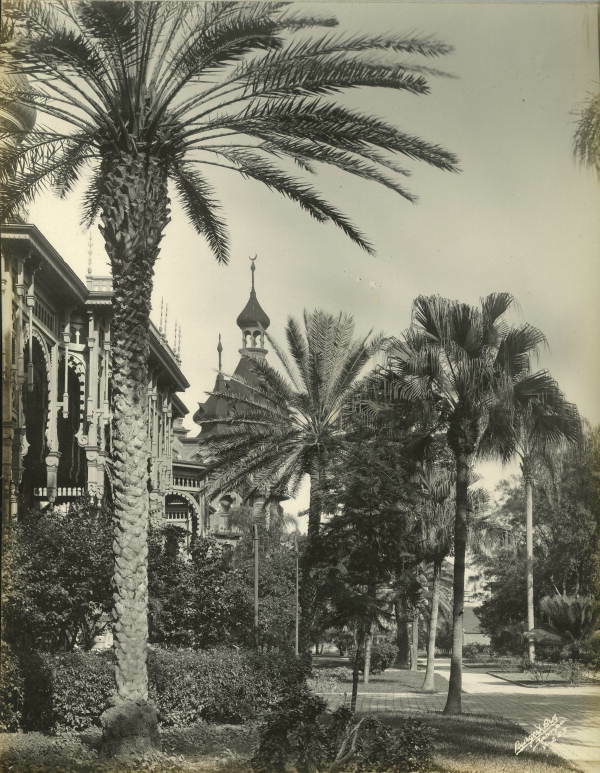 Then we went to the Hotel Royal Poinciana and had tea in the Coconut Grove. Here was a most pleasurable sight in watching the handsomely gowned men and women dancing on a glazed platform beneath the pals, sipping cool drinks and listening to a perfect orchestra, while the sun sank low in the lake and they lit the red lights in the grove. Then we returned to W.P.B. 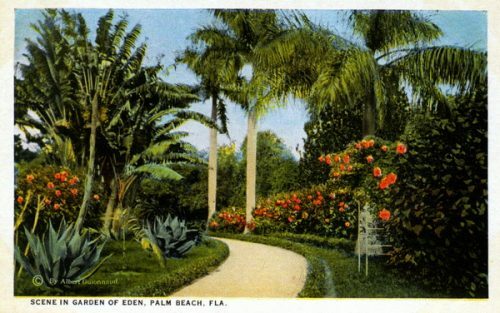 [West Palm Beach] and sat in the little park where men were pitching horse shoes and others played games at rows of tables. Took train for St. Petersburg at 8:30 P.M.
March 18, 1925: The train (Florida Northwestern) which carried us to St. P is on a new road and one of the best appointed on which I have ever ridden. We arrived here at 10 A.M. and came to the Floronton a nice quiet homelike hotel. This city seems quiet in contract to the cities we have just left on the east coast, though there are plenty of people, chiefly old folks, and the streets are loud with machines. This afternoon we took a limousine and rode out to the suburban towns of Pasadena and Jungle where Walter Hagen the golf champion lives. These are new developments rapidly building with wide well paved, well-lit and flowered bordered boulevards. We crossed the long bridge over Boca Siega Bay and drove around Passe-a-Grille which extends out into the Gulf of Mexico. There is a nice little beach here, fishing and bathing are the favorite pastimes. We saw many pelicans diving into the water and the beautiful blue and white herons are frequently seen in the marshes. There are many beautiful little palm dotted isles in the bay. Tonight, there was music in the hotel, then we took a walk and later saw the open-air movies from our room. We saw a very promising banana plantation near the hotel. The fruit is not large but has an excellent flavor and grows rapidly. March 19, 1925: This afternoon we sat in William’s Park and heard the Highlanders play. I like their music. It is gay and sprightly. Here we met Mr. and Mrs. Weinberg of Atlantic City. The park is full of people who seem to live constantly in the open air here in St. Petersburg. For this reason, all of the sidewalks are lined with benches and chairs of every description which never go begging. This leads one to believe that St. P. is composed of tourists and leisure class exclusively. 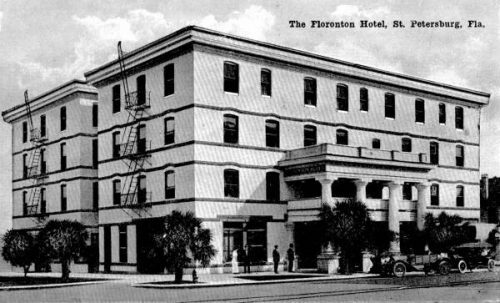 But they are also kind and friendly especially at this hotel (the Floronton) and I must add that the help here are of the nicest type with which I have yet met in Florida. We went around to see the new [Sersus?] Hotel, a very fine-looking structure situated in front of a park overlooking the bay and surrounded on the ground floor by pretty art shops. In the evening colored entertainers walk around the streets and stop in front of the various hotels to sing and play. The streets always present a lively appearance. 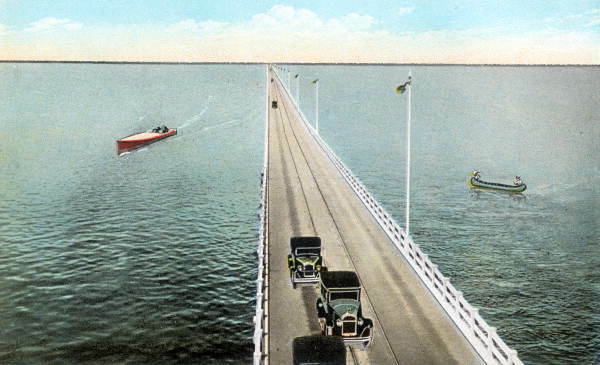 March 20, 1925: This morning before we left St. Petersburg we had the first rain of our trip, a pouring drenching shower which abated just as we got ready to leave in the bus at 7 a.m. We crossed the Gandy Boulevard and Bridge, 6 miles long, a famous and truly remarkable engineering feat recently completed, where they have dreaded and made land inch by inch. In time they will fill in this entire section and we are told that all the land beneath this water has already been sold. We entered Tampa by way of the Memorial Highway marked by a granite shaft inscribed to the soldier dead and came to the Tampa Bay Hotel. After lunch we hired a car and rode along the beautiful Bay Shore Drive with its sea wall on one side and costly [raised?] [unreadable?] on the other, and there a new suburb where stucco bungalows of the Spanish type predominate. Then on thru the business section of the city which appears to be quite an industrial center, here are many dry goods shops and Mass’ is a fine department store. Then we rode thru Ybor City formerly a separate township, where live many Cubans and Italians and here is a decidedly foreign air along the narrow street where at [?] one catches a whiff of tobacco [?] from the nearby cigar factories [unreadable?] – Tampa is the largest, or the scent of coffee roasting, and we stopped at one of the coffee shops to taste it prepared in the Cuban way. Tampa Bay Hotel, a National Historic Landmark, now part of the University of Tampa. Via. March 21-22, 1925: Last night there was a gay throng at this hotel when 250 schoolteachers, mostly young women, held a banquet here. They looked very pretty and had a good time singing and speech-making. 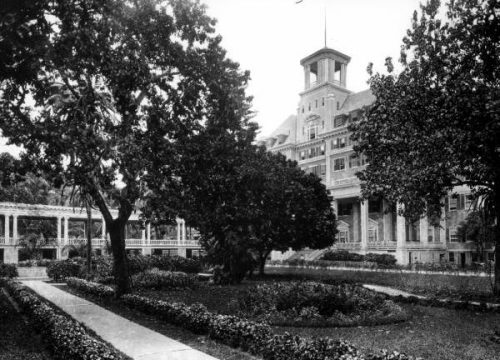 This hotel was built by Henry Bradley Plant, 1st president of the Seaboard Airline and originally the train pulled right up to the door. It is built in Moorish design, wide spreading with enormous high ceilings and rooms filled with a great array of curios, porcelains, bronzes, marbles, crystal mirrors, paintings and all manner of antiques. 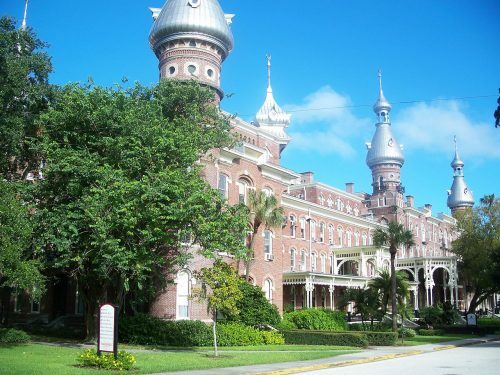 Although Mrs. Plant is said to have removed 15 carloads of furnishings at her husband’s death, when the property was turned over to the city, there is still ample material for a good-sized museum. It is situated in the middle of Plant Park surrounded by spacious verandahs and beautiful shade trees and flowering bushes. Provisions are made for various games including tennis, croquet, horseshoe pitching, etc. and there is also a children’s playground. A good band plays in the park twice daily. There is a pair of beautiful peacocks on the grounds and the birds sing everywhere. Their voices are the first we hear in the morning. The Hillsboro River runs thru the foot of the park and this stream, which is navigable, empties into Tampa Bay. There is a fine orchestra of 8 men at the hotel and they have concerts mornings and evenings. Last night there was a dance in the very attractive ball-room. The food here is most excellent and abundant and it is an ideal place to rest. 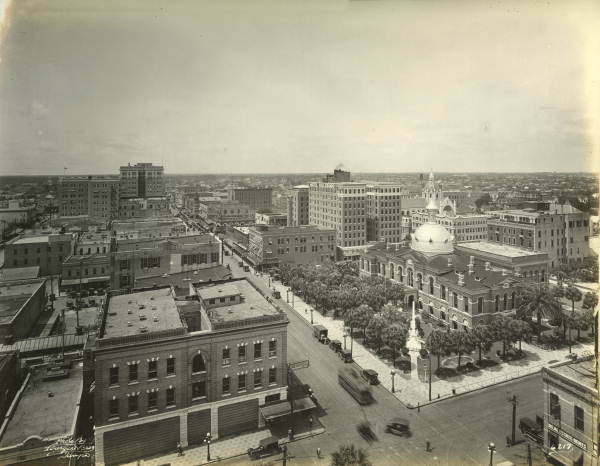 The city of Tampa is the 2nd in size in Florida, numbering 100,000 inhabitants, but unlike most Florida cities the population does not manifest itself on the streets but rather attends strictly to business. The cigar workers, [—fly] Cubans and Haitian, are said to work but two- or three-days week, beginning at day break, stopping an hour or so for breakfast and lunch and stopping shortly afternoon noon, but the entire family, father mother, and children work. It has been very warm here, around 78 degrees but today is cooler. This is the final entry for 1925 in Grace’s journal. Next week we pick up with the final entry in this particular diary – October 1926: The Philadelphia Sesquesentennial Exposition! This month’s edition of JMM Insights comes from Tracie Guy-Decker, deputy director. She’s sharing a behind-the-scenes look at one aspect of the development of our two newest exhibits, Fashion Statement and Stitching History from the Holocaust. Missed any previous editions of JMM Insights? You can catch up here! When I was about 7, I really wanted Jordache jeans. It was the early eighties. They were twice the cost of the Wranglers, but they also brought a currency with them the Wranglers just didn’t have. The Wranglers might have fit, but I believed the Jordache would help me fit in. Despite my first-grader experience with jeans, historically, clothing labels were usually hidden from everyone but the wearer. Their generally “hidden” status makes the importance of labels all the more remarkable. 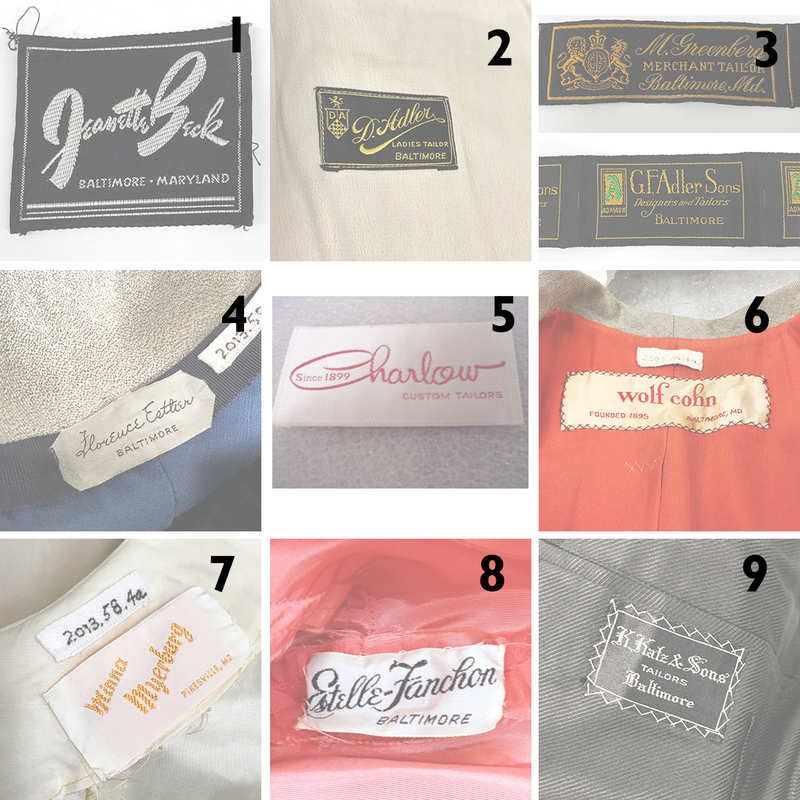 Clothing labels can carry a lot of weight – I don’t mean literal pounds, but rather intellectual, sociological, and emotional heft. Labels are a way for designers and manufacturers to make their mark (literally) and for clothing wearers to assert their belongingness to social circles. This ubiquitous “artifact within the artifact”—and all the associations it brings with it—is a common thread between Fashion Statement and Stitching History From the Holocaust. 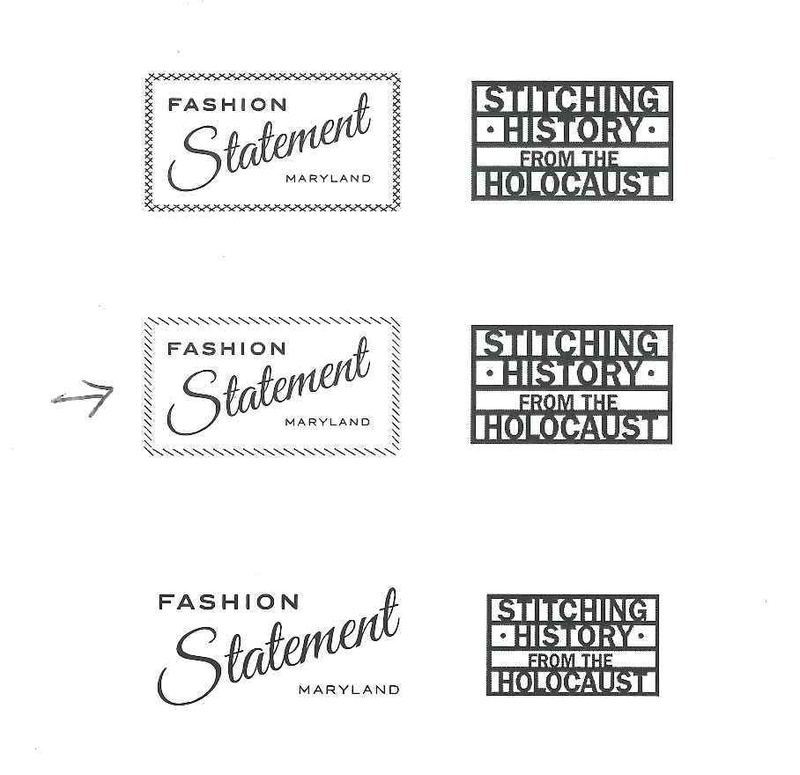 Our wonderful “Fashion Statement” logo, by Jeremy Hoffman of Ashton Design, was inspired by several of the local clothing labels in the JMM collections (for details, see the end of this post). From the stitched border to the swooping, elegant font, Jeremy captured the essence of a high-end dressmaker, tailor, or department store’s look, without directly copying any particular shop’s logo. We worked with Jeremy and his team through several iterations to get to the final design. Both the JMM and the Ashton Design team looked and thought deeply about the implications of font choice, word placement and size, and the relationship between the words in the logo to each other. The images above may look incredibly similar, but to a designer’s eye, the tiniest details matter! For the in-gallery version of the logo—the first thing you see as you enter the gallery—the Ashton team came up with the brilliant idea of actually stitching the letters. They designed a board with pre-drilled holes at the appropriate places to allow them to render their existing logo design in a thick thread. The effect is of a giant clothing label. 7 hours of sewing in 17 seconds. 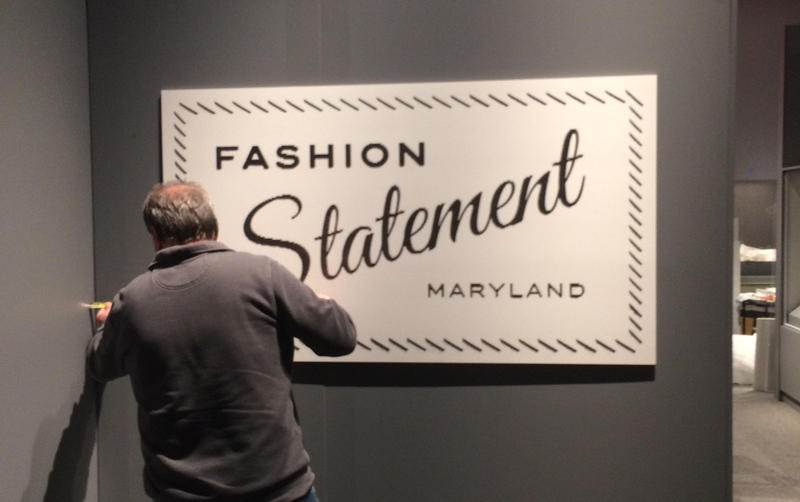 Title panel for “Fashion Statement” — a new exhibition at @jmm_md. Our colleagues at the other JMM (Jewish Museum Milwaukee) and at the Costume Shop that created Hedwig Strnad’s designs for Stitching History From the Holocaust also approached their work with an understanding of the power of the clothing label. 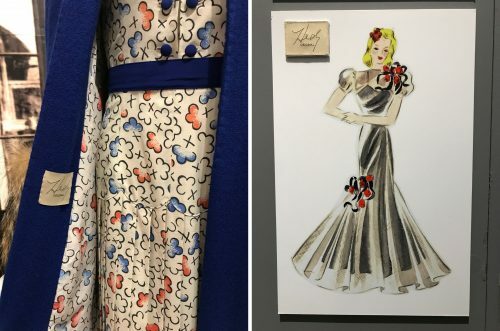 As they poured their hearts and passion into the project of making Hedy’s designs real, the artists at the Milwaukee Repertory Theater Costume Shop decided that the dresses needed a label. 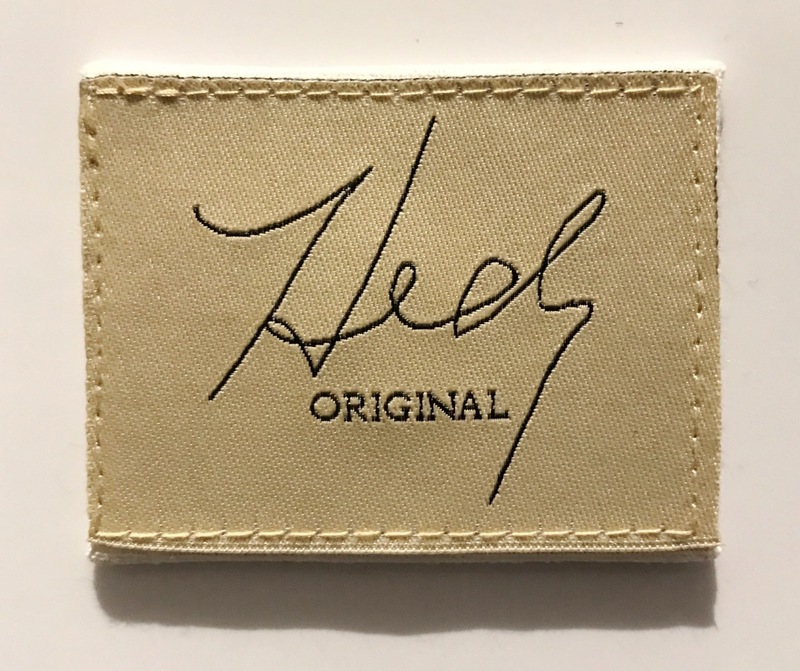 Regardless of how finished the dresses might look, they could not be complete without a label to identify their designer. Hedy’s signature, found after several years of research into her story, was used to create her own label, one that—at least for these dresses—she sadly never achieved in reality. Hedy’s label transforms a very personal element from one of the surviving letters and creates a brand identity out of it. When we see it applied it to the professional, stylish recreations of her designs, we are reminded both of the power and importance of the clothing label, and the talent and skill Hedy could have brought to the American fashion industry, had her story ended differently. If you haven’t seen them, yet, we invite you to come and see Fashion Statement and Stitching History at the JMM. And whether you’ve seen them or not, try to pay attention to clothing labels for a few days. What reactions do you have when you see them in your own clothes or in the store? You might be surprised at how the label alone can evoke thoughts or emotions. After all, clothing is a language. We use it to communicate with one another about who we are and where (and with whom) we belong. Labels are one form of punctuation in that unspoken language. 1. Jeannette Beck, Baltimore, Maryland. Gift of Isidore Schnaper, JMM 1992.112.2. 2. D. Adler, Ladies’ Tailor, Baltimore. From fur-trimmed opera coat owned by Anne Adler Salganik (daughter of David Adler, the tailor in question). Gift of Gordon J. Salganik, JMM 1990.133.2. 3. (top) M. Greenberg, Merchant Tailor, Baltimore, Md. Roll of nine unused labels. Gift of Zelda Cohen, JMM 1988.159.2. 3. (bottom) G.F. Adler Sons, Designers and Tailors, Baltimore. Roll of nine unused labels. Gift of Ruth Lev, JMM 1990.10.6a. 4. Florence Esther – Baltimore. From a custom-made cloche hat owned by Margot Zipper (object 34 in “Fashion Statement”). Gift of Margot Zipper, JMM 2013.58.2. 5. Charlow, Custom Tailors, Since 1899. Gift of Kenneth Charlow, JMM 1990.203.5. 6. Wolf Cohn, founded 1895, Baltimore, Md. From a bespoke ladies’ suit jacket owned by Naomi Biron Cohen. Gift of Maxine A. Cohen, JMM 2004.114.1. 7. Minna Myerburg, Pikesville, Md. From a satin evening gown owned by Margot Zipper (photo accompanies object 34 in “Fashion Statement”). Gift of Margot Zipper, JMM 2013.58.4. 8. Estelle-Fanchon, Baltimore. From a pink chiffon dress worn by Sara Fox Hettleman. Gift of Ellen Kahan Zager, JMM 2015.45.2. 9. K. Katz & Sons, Tailors, Baltimore. From morning coat owned by Samuel Sakols (object 16 in “Fashion Statement”). Gift of Blanche Sakols Schimmel, JMM 1987.39.2.